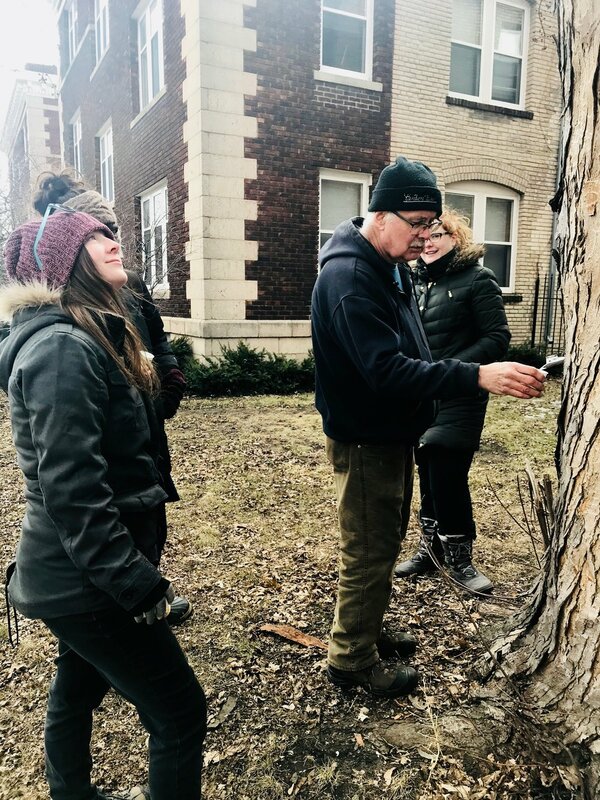 Tapping a silver maple in front of an apartment building. Finding a place to forage doesn’t have to be complicated. Start in your own yard or other piece of property (if you have one)! Even if you rent or live in an apartment, your building may have some green space that holds edible weeds, shrubs, or trees. Then do some exploring in your neighborhood. It may contain yards, hunting grounds, business landscapes, farms, or community gardens that hold delicious foods and healthful medicines. In these cases, you need to ask permission from the property owner, renter, or manager before picking. Most people are perfectly fine with friendly strangers harvesting their weeds or dropping fruits. I have even held urban foraging workshops at these kinds of locations. You may want to ask the property owner if they use any toxic pesticides, to avoid eating contaminated food. Picking crab apples along the Midtown Greenway. Twin Cities residents can explore the Midtown Greenway for wild edibles and medicines. The Midtown Greenway is a bike corridor in south Minneapolis that runs east-to-west between 28th Street and Lake Street. It was converted from railroad tracks and is owned by the Hennepin County Regional Railroad Authority. Foraging along the Greenway isn't illegal, but it isn't sanctioned either, due to concerns over soil contaminants from the railroad, which include arsenic and petroleum products. However, there are ways to work around soil contamination; see this blog post for more information. Many people express surprise when they learn that foraging is completely illegal in most city and county parks. The Twin Cities Metro has an extensive park system, a map of which can be found here. The ordinances concerning city and county parks are listed below in alphabetical order. Chapter V, section 1 of the ordinance says that “it shall be unlawful for any person to intentionally remove, alter, injure, or destroy any tree, plant, rock, soil, mineral, or other natural feature without a Permit.” (source) Mushrooms are not explicitly mentioned in this ordinance, so I called the parks office to ask. They told me that mushroom harvesting is not allowed in the park unless requested via a special use permit. Section 91.07 of the ordinance states that “it shall be unlawful for any person to intentionally remove, alter, injure or destroy any tree, other plant, rock, soil or mineral.” (source) Once again, mushrooms are not mentioned. I called the parks office and they said that the ordinance covers living things in general, so they don’t authorize or permit mushroom harvesting. According to Chapter V, Section B of the ordinance, “it shall be unlawful, when in a County Park, for any person to intentionally remove, alter, injure, or destroy any tree, plant, or other vegetation, soil, mineral or other natural resource.” (source) Can’t get much clearer than that! Until recently, foraging in Minneapolis parks was completely illegal. (source) Getting caught “molesting vegetation" (as they call it) resulted in fines for many people. At Four Season Foraging we actually know a few people who have been ticketed for this. On November 29th, 2017, the MPRB rule regarding "molesting vegetation" changed. It is a lengthy read, but basically states that the general public may harvest certain fruits or nuts from certain areas within the park system, as long as it's for non-commercial use. 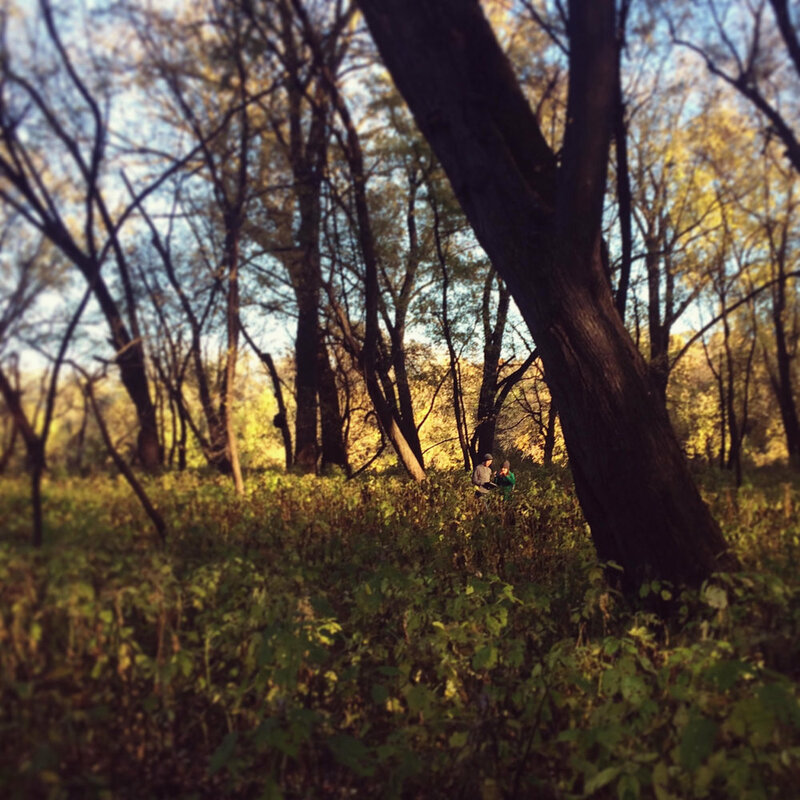 Here is the document detailing where and what you can forage in the Minneapolis Park System. According to Chapter 11, Section B of the ordinance, “it shall be unlawful for any person to intentionally remove, alter, injure or destroy any natural resource without written authorization from the Director.” (source) I tried calling the parks office twice to ask how one receives authorization from the director, but both times the person who handles those things wasn’t available, and I haven’t received a call back yet. If you’re interested in obtaining permission, you can try calling 651-748-2500, or filling out this contact form. “The intentional removal of any natural resource from within the park system without prior written permission from the director is not allowed. This includes but is not limited to: trees, plants, shrubs, flowers, water, soil, wildlife, stones, and turf." (source: Chapter 4/Section 13) To try to obtain permission, email a request to parkscustomerservice@ci.stpaul.mn.us with the desired date, time, and location. The ordinance states that, “it shall be unlawful for any person to intentionally remove, alter, injure, eat, or destroy any tree, plant, rock, soil or mineral without a permit.” (source: Chapter 5/Section 1) Scott County Parks are in partnership with the Three Rivers Park District, so the law is the same. A limited amount of permits are issued for educational purposes. According to Chapter V, Section 1 of the ordinance, “it shall be unlawful for any person to intentionally remove, alter, injure, eat, or destroy any tree, other plant, rock, soil, or mineral without a permit.” (source) Notably, mushrooms aren’t mentioned on this list. So I called the parks office to ask about mushroom hunting, and they told me it is not permitted. They issue limited permits for educational purposes. The ordinance states that “it shall be unlawful for any person to intentionally remove, alter, injure or destroy any tree, other plant, rock, soil or mineral.” (source: Chapter V/Section 1) Again, this ordinance does not mention mushrooms, but I called the parks office and they said that you are not allowed to pick them. Searching for mushrooms at Fort Snelling State Park. Depending on where you live, you may have to search farther from your area of residence. Some cities have wilderness areas that are quite accessible. For example, Fort Snelling State Park and Minnesota Valley National Wildlife Refuge are just outside of Minneapolis, and reachable via the blue line light rail. At Fort Snelling and other Minnesota State Parks, it is legal to harvest edible fruit and mushrooms as long as it's for personal, noncommercial use. Commercial harvesting is not allowed. Picking wildflowers or other plants (edible or not), is completely illegal, even if it’s for personal use. It is legal to harvest up to one gallon (per family) of berries, nuts, and mushrooms from Minnesota Valley as long as it's for personal use. In Minnesota State Forests, you may collect berries or mushrooms for personal use. You may also pick up cones from the ground to take home. (Probably not relevant to foraging for food, but good to know nevertheless!) Here is a map of Minnesota State Parks, and here is a map of Minnesota State Forests. Parks and forests managed by other states generally have similar laws. Check your local ordinances first to make sure. Now that you know the basics of foraging legality, go out and start doing it! Wild edibles are surprisingly easy to find, and once you discover some suitable areas, you can keep returning season after season, year after year. It’s a great practice to build— try for yourself!